Acacia fibre is a type of soluble fibre harvested from the sap of the Acacia tree, which is native to parts of Africa, Pakistan, and India. Soluble fibre, as part of the diet, can help to encourage intestinal regularity. It also acts as a prebiotic that supports the vitality of the good bacteria that help maintain a healthy GI environment. Acacia Powder is a gentle fibre, well tolerated and can be used daily. 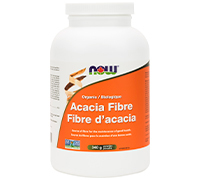 NOW’s Acacia Fibre powder mixes instantly and is ground for improved mouth feel. One serving (1 level tablespoon) of this powder provides 6 grams of soluble fibre. Natural colour variation may occur in this product. Adult Dosage: Mix 1 level tablespoon per day into at least 240 mL (8 oz) of water or juice. Maintain adequate fluid intake. Take 2 hours before or after taking other medications. Do not use if you have diabetes mellitus in which blood sugar is difficult to regulate. Do not consume this product if you have difficulty swallowing and/or have bowel obstruction. Consult a health care practitioner immediately if you experience chest pain, vomiting, or difficulty in swallowing or breathing after taking this product. Consult a health care practitioner prior to use if you are pregnant or breastfeeding, if you are taking medication which inhibits peristaltic movements (e.g. opioids, loperamide), if you have a potential or existing intestinal blockage, paralysis of the intestine, megacolon, faecal impaction, inflamed bowel, appendicitis, or if you have symptoms such as abdominal pain, nausea, vomiting, or fever (as these could be signs of abnormal constrictions of the gastrointestinal tract, diseases of the esophagus, and/or the superior opening of the stomach (cardia)). May cause temporary gas and/or bloating.